Kanban Task Manager for SharePoint V3 has been released! The new version has several enhancements, like a possibility to use swim lanes, a zoom and an instant search feature that begins searching as soon as you start writing. There are also additional ways to move tasks within or between phases and lanes. Several subscribers have asked for swim lanes in Kanban Task Manager, to get a possibility to group tasks and get a better overview. The new version therefore creates a Lanes list at activation on a site, Enter your own values in the list, and the lanes will be shown on the kanban board. If you don't want to use swim lanes, don't add any items to the Lanes list. Then no lanes will be shown on your kanban board. Right from the first release Kanban Task Manager has given a possibility to drag and drop tasks with the mouse. In version 3 you can also use keys (Ctrl + arrow) to move tasks within or between phases and lanes, and if you have a touch screen you can drag the tasks with a finger. In version 3 of Kanban Task Manager you can zoom in an out on the kanban board, by dragging a bar to the left to see details and to the right to see more tasks. You may also use the same method as you normally use with web pages: Ctrl + the plus or minus key. This new zoom is one more way of viewing the tasks in the best way. There is also the filtering – by project, responsible, priority and a custom value – and the details pane, which shows more of the task text at the bottom of the screen. Kanban Task Manager for SharePoint V3 also has an instant search, that suggests hits as you are writing, and the design is responsive so that the kanban board adapts well to different screen sizes. The kalmstrom.com developers have also enhanced the performance, so that Kanban Task Manager now responds quicker on all controls. Earlier you could format the text in the description field of the Kanban Task Manager tasks,and now the default setting also lets users add images, tables, links and videos in that field. This enhanced rich text is useful for the task description, but to have a clean look and a good overview of the tasks on the kanban board, we have chosen to give the kanban cards a fixed design. 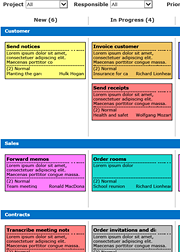 Therefore the formatting cannot be seen on the kanban cards. Links are clickable directly on the cards, but other formatting is only visible when you open the task. Free upgrades are included in all kalmstrom.com Subscriptions, so we recommend current users to upgrade their installations. Just replace the file and reactivate Kanban Task Manager, and then you can continue working with your tasks. If you have not yet tried Kanban Task Manager, you are welcome to evaluate the solution for 30 days without any obligations. We give support during the evaluation period as well as when you start a subscription. That is the least we can do when you spend valuable time on evaluating our SharePoint Solution! There are two Outlook versions of Kanban Task Manager, one for workgroups and one for single users. Soon we will release updates of these versions too, with the same enhancements as we have given Kanban Task Manager for SharePoint. I will come back to you about that!